Cobb resident and Middletown High School senior, Emma Zalusky, developed a Cobb Trails and Pathways map as part of her required Senior Year Project in Dec. 2013. Many thanks to Emma and her parents for the valuable analysis and presentation of community trails and pathways in the Cobb community. Emma’s map will be invaluable to the work of the KRT South County – Cobb Area Project Team. The KRT and the community of Cobb thank Emma for generously sharing this information. Please note that the map may not be duplicated without permission from Emma Zalusky, and may not be sold or used for commercial purposes. LT – Vernal springs off Bottlerock Rd. RT – Connect Boggs to the rest of County because of heavy use. 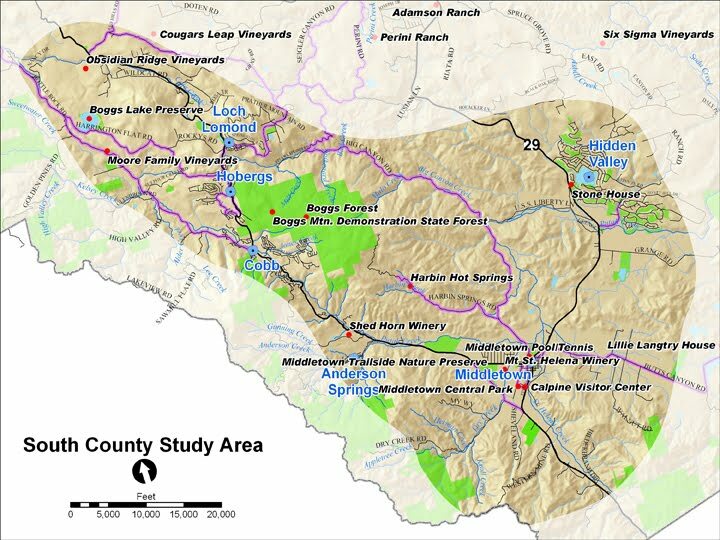 CP – Use Putah Creek as a connection to vineyard on Butts Canyon Rd. (Mdltn to Butts Canyon Rd. CP – Ford Flat Road access to use this as a trail? Highland Springs to Boggs connection & connecting South County to the rest of Lake County are KEY. What is the County-owned parcel in SE corner? County insurance needs/offers. Big challenge to landowners agreeing to an easement is their liability and who insures against accidents and how can reasonable rates be achieved? Are there any land trust holdings in SC?